There’s nothing I like more than a surprise party, but I am a terrible person to surprise – just ask my husband. Before a birthday I’ll try to work out every scenario that may have been planned, let my imagination take flight and end up disappointed with what actually does happen. It’s a flaw in my character. 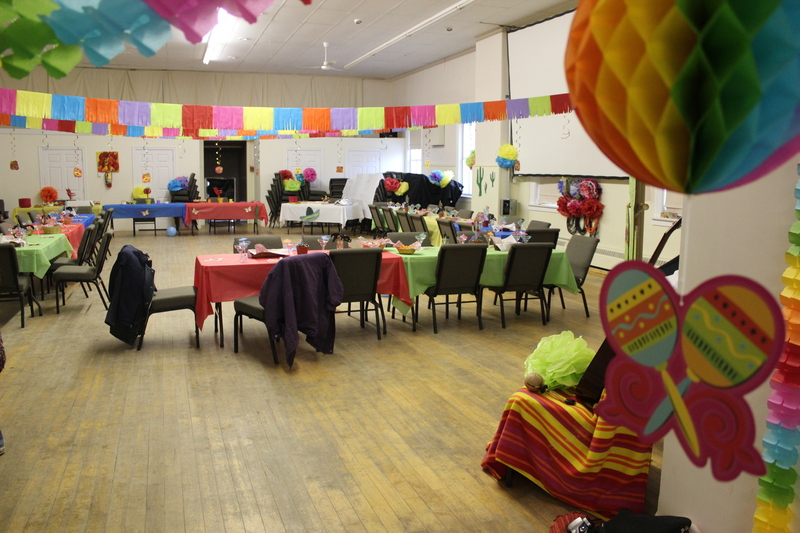 Then I scrolled down and saw a twitter post from Christ Central Church Fredericton which had a picture of the hall decorated for a Mexican Party. I arrived there this afternoon to drop off a dessert, my small contribution. The windows were blacked out with bin liners so no one could see in. Walking in through that door brought tears to my eyes, it was beautiful. So much effort had been put into the decorations from giant painted cacti to tissue paper flowers, coloured cocktail glasses, coloured decorations everywhere and even fake moustaches for the guests. The team who put this together must have put a lot of thought into all the detail and spent hours getting it all ready. It wasn’t for my benefit of course. Monday night is Street Level Drop In night, when those who are homeless or on low-income come in for a ‘hot meal and a safe place to enjoy time together’ (taken from Christ Central Church website). This week was different. Kelly and the team threw them a party…just to give them a surprise. Just to give them a treat. It touched my heart. Some might say, ‘What’s the point?’ or ‘This sort of thing won’t change their circumstances.’ It might not, but it is all part of doing justice and showing the same sort of lavish, undeserved love that God shows to us – and it’s fun. As I mentioned in a previous post, I’ve been reading Generous Justice by Timothy Keller. Throughout the book he describes the Biblical perspectives on promoting justice and compassion for those in need – worked out through our experience of God’s generous grace. It’s radical, and kind of encompasses everything in life. It is a lifestyle. I’d say that party falls under the, ‘generous giving of your time and resources.’ What a simple and yet beautiful thing to do – to throw a party for people, some of whom would never, ever have had a party given just for them before. I’ve got to hand it to you Street Level Team, I wasn’t even a guest and you blew me away. Back to that quote I saw at the beginning of the day, ‘Justice is doing for others what we would want done for us.’ As a person who loves parties, I got this one today in relation to this event. Inevitably it extends much further, into the areas Tim Keller mentions above. Which one of us wouldn’t want to be treated honestly and fairly, be on the end of generosity and rescued from injustice, violence and oppression?